Usually the tourists which are not in a private tour in Buenos Aires, skip this area or just do a seightseeing, while is a very nice and interesting area. At the end of the Avenida de Mayo, the National Congress raises up to the sky with a fantastic bronze cupola of 30.000 tons. 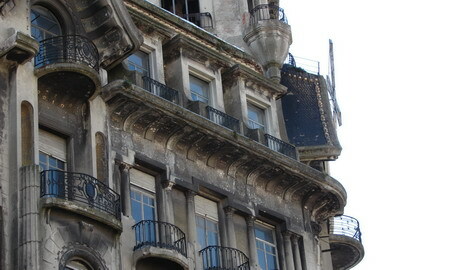 The building which sizes whole a block, was started on 1897 and ended during the Presidence of Peron in 1946. Designed by the same Italian that conceived the Teatro Colon, Meana, costed 10 times more than the original budget, that's the reason why it was called "the white elephant". The laterals are nicely decorated with Cariatids and at the front, at the base of the cupola, there is a victorious Republic riding a Roman Empire war carriage and hanging a wreath. But although the Congress is the main atraction, there are other interesting views, just a few steps arround. 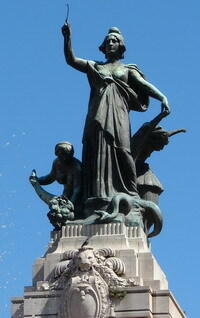 The most easy to see is the farmer Republic at the top of the Monument to two Congresses (meaning the senate and the Representatives chamber). This is a monument that simbolizes as the mountains (represented in the column and the Condors done in natural size) as the rivers of Argentina (represented on the fountains and dancing waters). The monument is a mixture of fantastic animals with real ones, and neoclassical figures. But, returning to the Republic on the top, this Republic is not a warrior one but a farmer: She is hanging a plow. At her right, a nymph spreading the abundance horn. This was the promise to the millons of inmigrants that were coming to the country in the early 20cth: food, land, happiness. Not always, or, almost never, the promise about the property of a land with cattle and nice conditions were submited, the starving europeans had to manage as they could, helping to each others according to the comunity the deserved, and they organized a resistance as in Europe through trade unions, anarchist newspapers, protests and hardly repressed strikes. So for those "rebels" there is at the left of the image of the Republic, a snake. That was the threath to the anarchists. The monument was opened in 1914, it was part of the celebrations of the first centennial, which found the Country divided in the "good families" (which could be read as the stablishment and the conservative middle class) against the "rabble" (the recent europeans inmigration combined with the local low class), and the monument is showing the vision of the stablishment about that conflict. Just in the same square, going far from the Congress, it is possible to apreciatte the first Thinker that Rodin sold out of France. This thinker is one of the biggest that Rodin did, and it was originally thought to be placed at the stairs of the Congress. Some day -Who knows!- they will put him there. 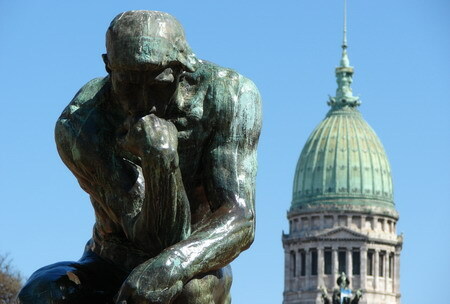 Rodin, sold many sculptures to Buenos Aires (Paid by the National Government) and also to private collectors. Get in mind that Buenos Aires was deliberately remodeled and structured to be the Paris of Southamerica, and also the private families contributed to that any time they need to build a new house, which become a fantastic palace. Most of the public buildings and big private houses and clubs, as parks where designed by europeans, mostly french. But The Thinker, is not an isolated sculpture, is part of a never ended project about the door of hell. The thinker is a representation of Dante. And Dante, in Buenos Aires, have his "personal office" at a few steps from the Thinker. 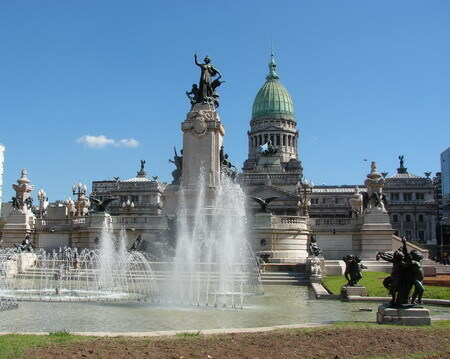 At the Avenida de Mayo, there is a fantastic building, which was the highest skycraper of Southamerica, full of esoteric meanings and plempty of sculptures, which was conceived to be as building office as the Mausoleum of Dante, just in case "a second World War occurs". As you know, that war happened, but Dante's ashes never camed. Well, the complete story of that building is other story, now we can go back to the Congress and at its left, we will aprecciate a beautiful art nouveau building, The Windmail. The Windmill (Confiteria del Molino), strategically placed to feed all those representatives, was a nice coffee with its own bakery shop beside the Congress at Callao Av corner with Rivadavia Av. The group is completed with a condominium of 5 floors and a cupola with the windmail itself. The Windmill (Confiteria del Molino) was one of the main competitors of Tortoni Cafe, located in the same axis of the city: The Avenida de Mayo. The crown of cafes was completed with Las Violetas, and with the Confiteria la Ideal. All of them but Tortoni had their own bakery, and it was a competition about who was doing the tastiest pastries, at the end of 19 Century and early 20. But La Ideal was located closer to Corrientes Av. When this Avenue was widden on the late 30's, there appeared more cafes and pastry places, not as luxury as this one, but the fun axis was inevitably moved. Anyway what really killed the activity of this Windmill, wasn't the competition, neither the small battle during the cup of 1930, neither Maddonna and her filming set for the video "Love don't live here any more", but the many financial crisis we sufferered all along the 20 Century. Today is a protected but closed building. Special attention deserves the cupola with gold leafs and turquoise tiles, and the lamps on the top of the first floor. It was opened in 1919 and the design is from an Italian that also designed a fantastic skycraper, the hidden Güemes Gallery. Yes, we are not done yet with this neighbourhood. It was the end of the second axis of the city. (The first one was from south to north across Defensa st in San Telmo), this is the east to west axis, parisian instead of colonial. So, at the "end" of this luxury axis (the Rivadavia Av lasts 37miles, and we are talking about the first half mile) we can enjoy the best two samples of Art Deco and Art Nouveau done by Ortega, unusually an Argentinean Architect. 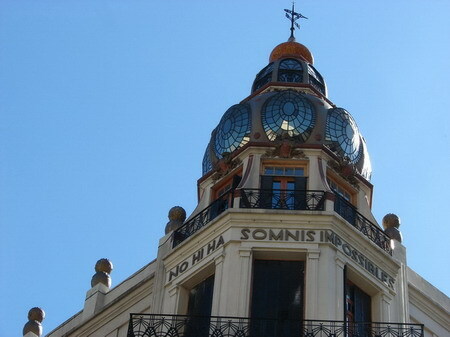 There is a fantastic Art Deco corner with a restored Cupola with the statement in Catalan "There is no impossible dreams". May be the architect meaning his own dream of doing something so amazing? May be. But as in a night we have many dreams, he also had another fantastic dream wich is the building beside, a palace that emulates the Mila House of Gaudi at Barcelona. Both buildings were recently restored and looks just bright. This is something to not miss and you may need a Private Tour Guide to Buenos Aires to discover more and more about this neighbourhood! In the latest 19 Century, there was a mobster's cafe. Each time the cops needed to clarify some crime or robbery, they use to go there, and tell to the barman, "Body, we need to talk with your Little Angels" and then they deliver everybody to the police station. So some day, The Cafe of the Little Angels became the formal name: Cafe de los Angelitos. Since ever it was a tango place but a heavy one. According to pass of time it was being more open to the standard people of the neighbourhood. The sweep of the financial crisis came for the head of this place, but then, the people protested in a particular way to save the place: They just organized milongas (Tango parties) on the street. It seems that God likes Tango (Do you know that God is Argentinean?) and now we have the fantastic Buenos Aires Tango Show Cafe de los Angelitos which was awarded as the best one in 2011. During the day, you can lunch or have some pastries. Afternoons, musicians plays tango on the bar. If you want to enjoy all the Congreso Neighbourhood secrets, contact me now!